Aides to Governor Deval Patrick fanned out across the State House yesterday, delivering copies of an 11-page, color brochure extolling the benefits of the governor's casino plan to individual lawmakers, a move that emphasized his key arguments in advance of the scheduled release today of an independent analysis by the Greater Boston Chamber of Commerce. The governor's brochure is largely a repackaging of his arguments in support of licensing three resort casinos. Created by administration staff for $1,000, it mentions that "tens of thousands" of construction jobs would be created, instead of the 30,000 figure they used for months before it was challenged this week as excessively optimistic. "It will lead to tens of thousands of construction jobs, over 20,000 permanent jobs, and millions of dollars of new revenue," read a letter accompanying the brochure, written by Daniel O'Connell, the state's economic development secretary. But in the glossy magazine, there are no dice. There's no slot machine. No golf course, spa, or restaurants. No casino. 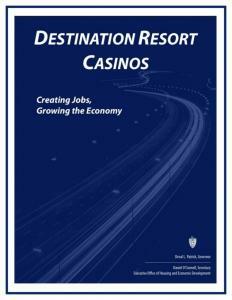 Instead the brochure, titled "Destination Resort Casinos: Creating Jobs, Growing the Economy," uses stock photos. To illustrate the $50 million that would help those who develop gambling addictions, the administration used a stethoscope. In touting the money that would go toward communities experiencing spikes in traffic and crime, it used a group of people holding hands below the heading "community support." The pamphlet was quickly criticized by opponents of the plan. "It's like putting lipstick on a pig," said Representative Daniel Bosley, a North Adams Democrat and the chief casino critic in the House. "He keeps giving us the same information, wrapped up in a different package." "The pamphlets sent out by Governor Patrick today are not half as slick as his phony economics," added Barney Keller, spokesman for the state Republican Party. "Instead of wasting money sending out these mailers, he should be focusing on providing Massachusetts residents with real job numbers for his proposals." The brochure says 20,000 full-time jobs would be created; the state would reap $400 million in annual casino revenue, along with $50 million to $80 million in sales, meal, and hotel taxes. It highlights "the importance of acting now" by detailing the administration's concerns that the Mashpee Wampanoag Tribe would gain federal land and build a casino that the state would be unable to control. The chamber is releasing a report today that analyzes the legislation the governor filed in October. The administration said it released the publication in advance of a March 18 hearing. "As the hearing approaches, we feel it's important to provide the Legislature with as much comprehensive information regarding the governor's plan as possible," said Kofi Jones, spokeswoman for the state office overseeing the governor's legislation. It was the second day in a row that Patrick issued a direct appeal to legislators. On Tuesday he sent lawmakers a letter rebutting criticism from House Speaker Salvatore F. DiMasi, who cited a Globe report Sunday that said the construction jobs estimates were too optimistic. "It's interesting that the governor is going to this extent," said Representative Ruth B. Balser, a Newton Democrat who opposes casinos. "This kind of glossy marketing attempt, I've never seen come from someone else in government before."